When you need a product that provides beauty, uncomplicated style and overall safety and security in the shower, Bellin Health Home Care Equipment has a solution for you. 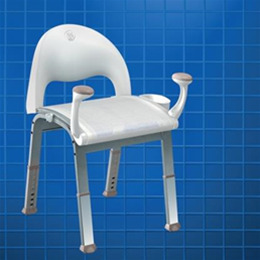 The Glacier Shower Chair by Moen provides you with safety and security in the bathroom without disrupting your décor. Visit the Bellin Health Home Care Equipment retail store today or call us at 800-453-7801 to learn more about the bathroom safety equipment we have available. Adjustable Height: 15" to 21"